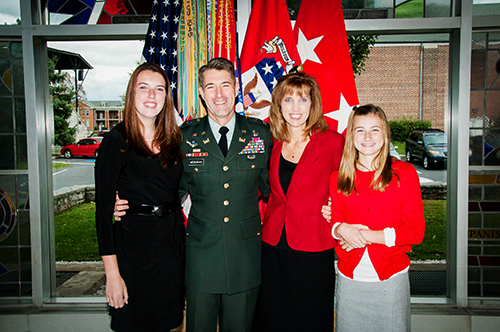 Steve McGugan’s passion to help people in the midst of crisis didn’t diminish when he retired from the U.S. Army. Only the battlefield has changed. Driven to run to the sound of the guns, as one of his generals said, and responding to urgent situations distinguished his 24 years in the Army, including 39 months in combat operations..
For millions of Americans with disabilities, gainful employment remains out of reach. Enable America is a nonprofit organization dedicated to increasing employment among the 56 million Americans with disabilities including wounded warriors and disabled veterans. Our goal is to work with all members of the community – inluding disabled individuals, service providers, government agencies, advocacy groups, existing organizations and employers – to eliminate barriers to employment and bridge the gap between disabled job seekers and the employers who want to hire them. 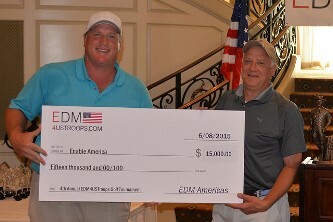 Above, clockwise from top left: Enable America board member Chet Culver accepts a $15,000 donation to Enable America. 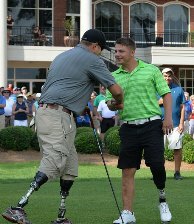 Military honorees Dale Beatty and Ryan Wightman shake hands on the first hole at Prestonwood CC in Cary, NC. 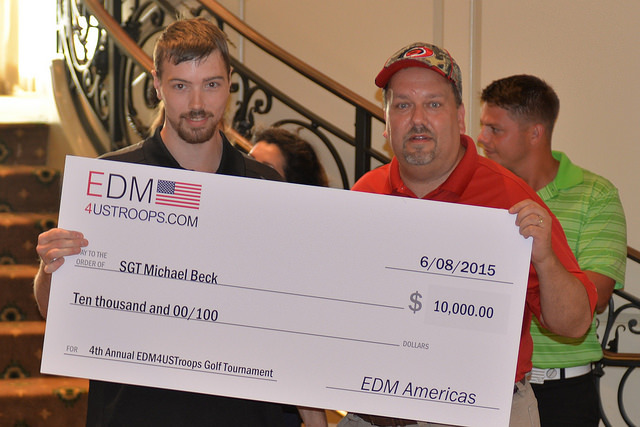 Honoree Michael Beck accepts $10,000 donation from EDM Americas President Scott Byers. 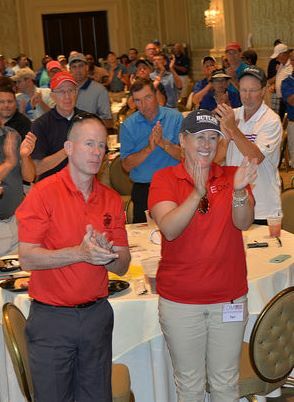 Attendees give honorees a standing ovation at the check presentation ceremony. Pictured: Tiffany Jacobs, WWP; Kelley Koch and Dana Jordan, Lowes; Amanda Hahn, LabCorp; Lt. Col. Nelson; CSM Brown; Katie Henry, SAS; Mindi McLendon, Parata Systems; Chris Scheib, Scheib Financial; and Sandy Moonert, Enable America. 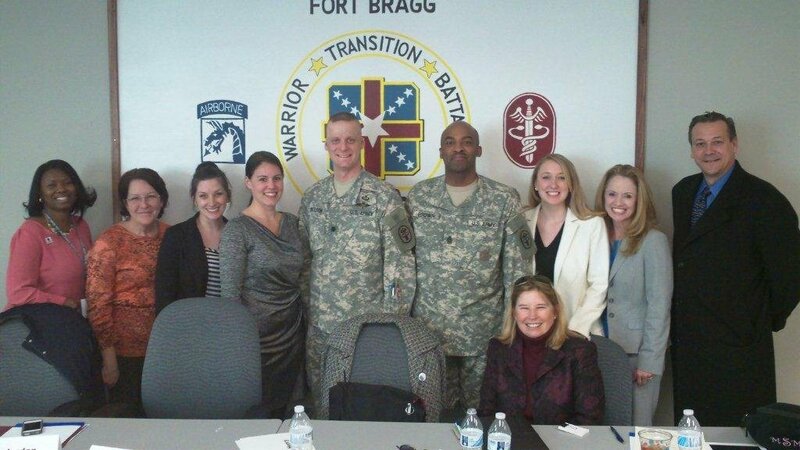 Enable America congratulates 35 transitioning soldiers and thanks our corporate volunteers who took part in our Job Seekers Workshop at Ft. Bragg, NC, on February 27. Also, we want to send a special thank you to Lieutenant Colonel Nelson and Command Sergeant Major Brown, for their personal welcome and recognition certificate to Enable America. These programs are made possible by financial support from the Duke Energy Foundation. 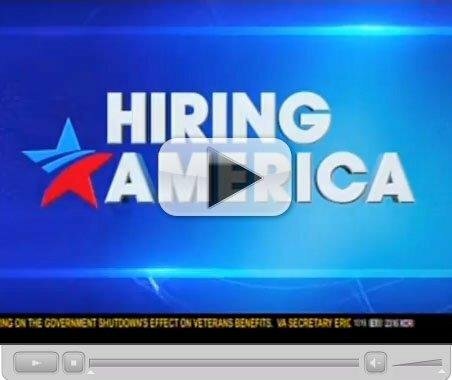 Job Seeker Workshops provide disabled veterans and transitioning soldiers with unique opportunities to work directly with human resource professionals, to improve the job seeking skills they need as they re-enter a very competitive civilian workforce. 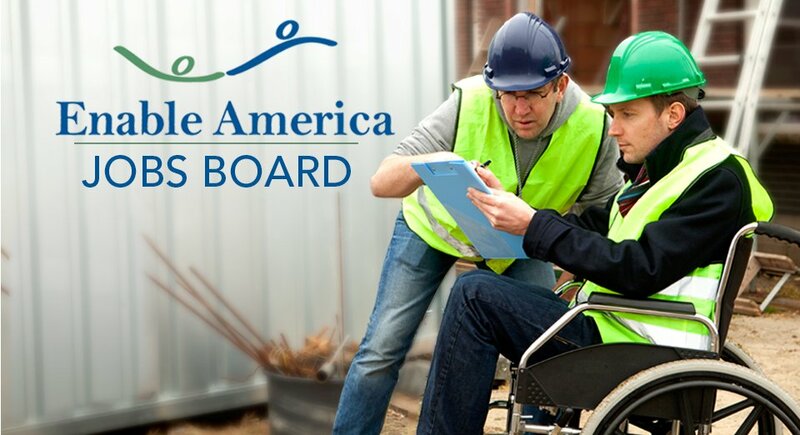 This program is another example of the bridges Enable America builds to improve employment opportunities for people with disabilities. Furthering the cause to improve employment opportunities for people with disabilities, Enable America conducted employment mentoring at multiple locations in Washington this September, including at the FBI. Enable America also gathered subject matter experts for a roundtable discussion on the achievements and challenges of employing more people with disabilities. The events were capped by a reception honoring Senator Tom Harkin and Congressman C.W. Bill Young for their commitment and contributions to this cause. See more pictures from Enable America’s Washington DC events here. Click here to access our secure form for donating to Enable America. JOB SEEKERS CLICK HERE to search the latest career opportunities. EMPLOYERS CLICK HERE to join our Jobs Board. CLICK HERE for Corporate Membership info. CLICK HERE to see Enable America's Partners. ABLE FORCE IS NOW HIRING! Founded in 2002, Enable America provides a wide range of programs that directly engage with and improve the lives of people with disabilities, including disabled veterans and wounded warriors. Watch this video to see highlights from the past ten years. 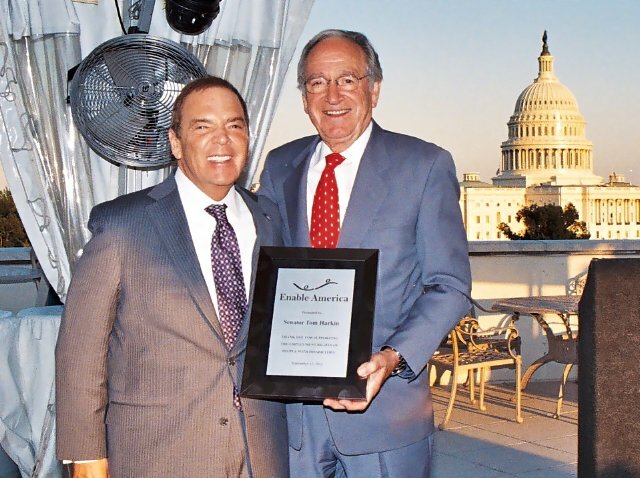 Senator Tom Harkin recounts his years of fighting for the rights of people with disabilities, as he accepts the Enable America “Award of Appreciation” at the 10th Anniversary Reception held in Washington, DC. Founder and CEO Richard Salem addresses the audience at Enable America’s 10th Anniversary Reception, recounting his journey as a person with a disability, and his inspiration for helping others. Isolation end where employment begins. Help our nation’s wounded warriors and people with disabilities take the most important step in reconnection with their communities. According to an informal discussion letter the US Equal Employment Opportunity Commission issued in August 2011, “paruresis” — more commonly known as “shy bladder syndrome” — qualifies as a disability under the amended Americans with Disabilities Act. This ethic was epitomized by the farmers, entrepreneurs, craftsmen, and small business owners who characterized the American cultural ideal of independence and held the notion of the work ethic (Ciulla, 2001; Jackall, 2008). She also ran out of money, signed up for disability benefits and has been unable to work again. The 47-year-old from Michigan is among the 8.7 million American workers on the US disability rolls, an important part of the social safety net. © 2002 - 2015 Enable America, Inc.